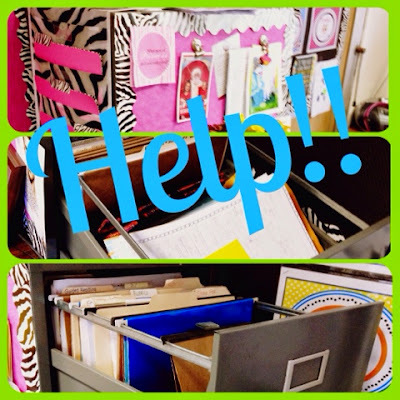 Pinkadots Elementary : Wordless Wednesday: Help me with Organization!!! Wordless Wednesday: Help me with Organization!!! Wordless Wednesday with Sugar & Spice! I need an organizational file cabinet intervention ASAP! Help! I never use my filing cabinet correctly. In my eight years of teaching, it has never been useful! I like the magnetic aspect of having a filing cabinet because I decorate it and it is great for displaying pictures, but the inside is a MESS. This is full of probably three teachers from 20+ years of work. Usually I use it to stack paper I will need to keep for the end of the year folders. Obviously I don't use ANY of the worksheets, but I never bothered to clean it. Should I keep it? Get rid of it? What do you put in yours? How is it organized? I'D LOVE TO SEE PICTURES! You can even post them to the Facebook thread on our Facebook page! I have mine organized chronologically by science and social studies units in my first 1 and 1/2 cabinets. The second 1/2 of the second cabinet has one drawer for reading units and one drawer for math units. For all my files, I have one folder with master copies of worksheets, project notes, and work samples. Behind each folder are books (fiction/nonfiction story books) that go along with the unit. This really helps me be able to quickly put my hands on anything I may need! - Good luck organizing if you decide to keep it! I have mine organized by drawers- Math, SS and Science, Reading/ELA, and class info. That is about as organized as mine is! I purged a lot out of mine this spring (1 full brute trashcan) and am using one full drawer to hold Reading A-Z books I already have made. I also have a drawer with copy paper and cardstock. One drawer has our science curriculum with the nonfiction to go with each unit. Other than that, it isn't organized yet. Good luck! I can't be of much help for organizing a filing cabinet because I never used mine this year, haha. I try to keep copies of all worksheets, etc. digitally to reduce paper buildup. The only thing I really kept in mine was my SPED binder with IEPs, my writing curriculum books, and files for individual kiddos. Mine is arranged by subject and then alphabetical file folders. At the back of the folders I add workbooks and teacher books that are also part of the subject of the drawer. I use hanging file folder because they don't slide down. Now, should you keep stuff? NO! If you have not used it in two or more years, throw it away. You know if you pull it out now, you will just re-invent it anyway! I don't use my filing cabinet like most people. I have one drawer that I organized all of my construction paper and colored copy paper! It's so easy to get certain colors this way!! I also have on drawer that houses all of my seasonal books. One drawer also houses my professional books and teacher read alouds that I don't put out for my kiddos.